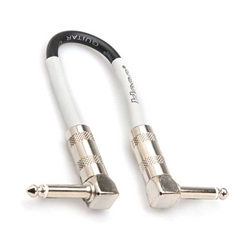 Made of oxygen-free copper, the CPE-106 guitar effects jumper cable features top-of-the-line Hosa quality and offers your instrument enhanced signal clarity. A dense OFC spiral shield and PVC exterior keeps your sound free of radio or electromagnetic interference, while protecting your cables from scuffs and scrapes. Each of the CPE-106's all-metal connecters is set at a right angle, keeping as much pedalboard real estate open as possible. The CPE-106's metal ends also screw apart, allowing for easy servicing if necessary. So, if you're looking for an excellent 6" pedal effects jumper cable at a phenomenal price, pick up a Hosa CPE-106!